I knew that I wanted the C bit of the A to Z Challenge to be about Collage Poetry, but who knew I’d find sooooo many creative folks out on the web. Wow! What talent!! I wish I could share everyone’s work that I came across, but more than anything, I wanted to show you how easy it is to create your own style of Collage Poetry. A different computerish version, even more blog friendly, can be found at Kyle Godfrey’s Blogger site. Just slightly different is Mary Bast’s version of photography with found and classic poetry, some of which can be found at The Pulitzer Remix. According to Austin Kleon, it’s just as easy as blacking out words you don’t need on a newspaper to create poetry. He has written a book called, Newspaper Blackout, which shares some of the poetry he has created in this way. How linktastic is this getting? And, I’m just beginning. We’re approaching my very favorite form of the poetry collage arts–the ones that could be found hanging in prestigious art gallery exhibits. It’s where my poems want to live when they grow up!! Vivian Faith Prescott prints out her poetry, cuts it into stanzas & pastes it to a collaged background. 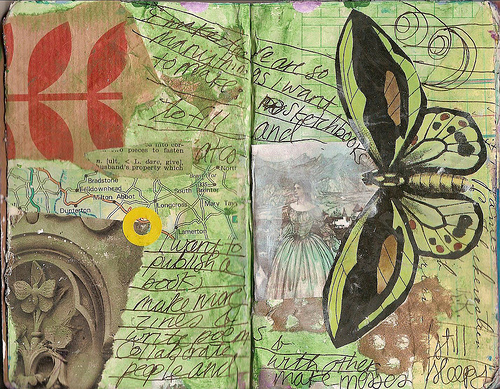 As someone who keeps art journals, I found these pages by Annie Yu to be breathtaking! Let’s be honest, my poetry would love to live in journals like hers too!! Mixed media artist, Jess Schneider, uses a variety of techniques to create her stunning poem-art. Some of Charles Henri Ford’s collage poetry can be find in one of my neighboring city’s university’s websites. These pieces date back nearly fifty years! Could I pretty please with whipped cream & a cherry on top take Sara Naumann’s workshop? Her work is gorgeous! Here is a quick, free tutorial, by Quinn McDonald, if you would like to try your own hand at a poetry collage. No matter which technique inspires you, you’re sure to create a one-of-a-kind masterpiece. Carpe diem!